The XA10 offers two memory card slots and 64GB of internal memory. It has a CMOS image sensor and can record at 1920 * 1080 resolution. Customers say that its handle is very useful and the lens quality is great. Rank: #1 out of 257. Canon XA10 is a top selling and one of the most expensive options. 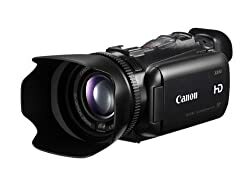 It's a #1 bestseller in camcorders category and has dozens of popular alternatives in the same price range, such as Canon VIXIA GX10 or Panasonic AG-UX90 . Canon XA10 is $1910.50 more expensive than an average camcorder ($289.95).